Hello players of nintendo and other worlds. I have summoned you here to compete in my grand prix. The winner will recevie a gold trophy.... of fredom. 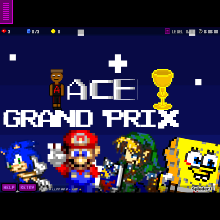 The winner of the grand prix will be released from the contract of race. Until then keep racing and defeat your foe. (This is a 2 player game grab your friend or family member to play along). Who should be saved first?